Tarek Chemaly: Of happiness and Ideas by Farid Chehab launching tomorrow at AUB! 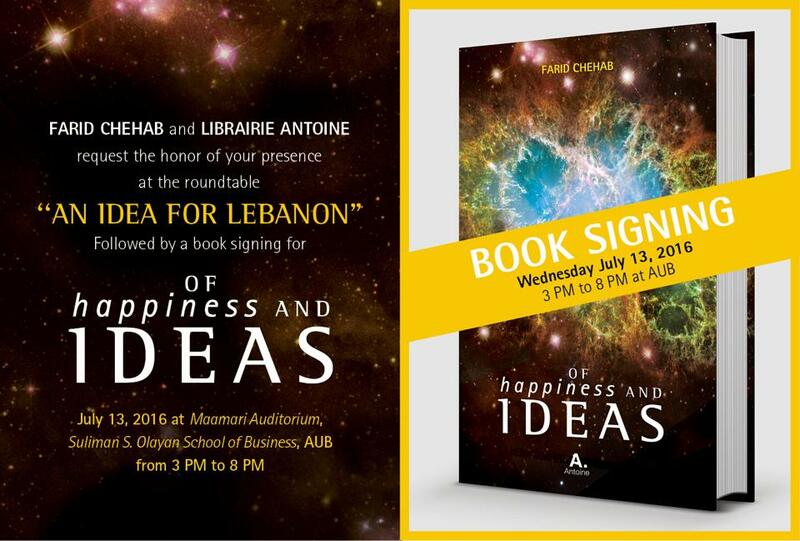 Of happiness and Ideas by Farid Chehab launching tomorrow at AUB! 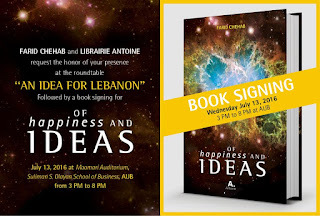 After the launch of the French version of the latest book by advertising giant Farid Chehab, the English version of the book "Of Happiness and Ideas" will hit the market tomorrow with a round table at AUB around the theme "an idea for Lebanon". Since I am the one who translated it, I got a advance copy signed from the man himself - a person I lovingly call a friend. All details found in the photo! A timely conference for a Lebanon in motion.